Whatever you need for your natural stone landscaping project, we’ll provide. We offer the following products to both homeowners and landscapers. Adding beauty to almost any landscape design, our natural stone boulders offer you a unique landscape material that cannot be duplicated in color or texture. We sell quality fieldstone boulders that you can use for many projects, including retaining walls, as accent pieces, to line dry creek beds and more. A popular choice for outdoor fireplaces, fieldstone is a natural stone that when cut can enhance any outdoor decor. Also used to build retaining walls, seating walls, custom pools, outdoor living areas and the like, fieldstone is a versatile landscaping material. Used for patios, around pools, to create outdoor living areas, walkways, interior bathrooms, interior sunrooms and similar structures, flagstones are a great way to add a touch of natural color and texture to any decor. A color-blended concrete product, pavers are popular for use in construction of driveways, pool decks, and outdoor living areas. With pavers, you can create a noticeably, more-aesthetically pleasing and upscale look than with plain concrete. 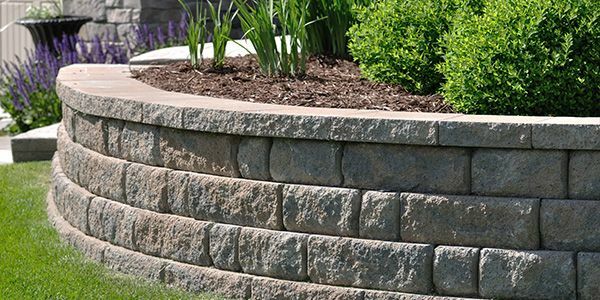 - Used for everything from erosion control to levelling out an area to create more usable space, our retaining walls come in a variety of sizes and colors to help you create the perfect backdrop for your outdoor living areas. - With five different kinds of modular block offered by Alliance Stone, you’re sure to find the perfect fit for your retaining wall projects. A large range of different types of gravel. These beautiful, natural stones can produce instant steps quickly and easily. - With the option of Gator Dust or Polymeric Sand, you can fill any gaps in your stone patio. For various architectural projects and designs, Alliance Stone is North Georgia's premier stone fabricator, with custom cuts and uses. Carrying all the hardscape materials you need for your next natural stone landscaping project, contact our North Georgia Natural Stone Supplier for one-stop shopping of your natural stone materials.